Buying a Condo: Pre-Construction vs Resale? Home » First-Time Buyers » Buying a Condo: Pre-Construction vs Resale? Whether you want to buy a new or resale condo, it’s essential that you’re represented by a qualified buyer agent that specializes in the Toronto condo market. There are arguments to be made for both sides of this equation. On one hand, the idea of spending hundreds of thousands to millions of dollars with only seeing a floor plan can be nerve racking. However, the idea of buying a brand new, never occupied unit can also be very enticing. When you are buying a pre-construction unit, the sales office only has a miniature model of the building, floor plans on the wall, and a model suite. Having a qualified agent with you at any new condo sales office is important, so that you have a knowledgeable guide to make sure that you make the right choices. It used to be true that pre-construction prices were lower than resale prices, but in recent years that has definitely changed. 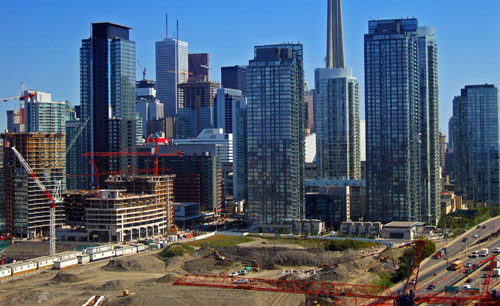 The frenzy of investors and first-time buyers interested in the countless new projects being launched in the City of Toronto, has driven pre-construction prices up significantly. In some cases prices are $100 – $200 more per square foot, in the more popular condo neighbourhoods in Toronto. A new condo buyer definitely has more choices when it comes to choosing finishes, floor plans, floor heights and upgrades. It’s important that you work with a condo agent that has access to VIP Broker Events, to secure these choices ahead of the public. Of course, a resale buyer can also make changes after the purchase, and having the right agent with the best contractor referrals can be beneficial at this time. The builder’s Agreement of Purchase and Sale can be a very complicated document, typically 50 pages thick and written exclusively to protect the builder. Resale Agreements are about five pages in length, but still can be very confusing to a first-time buyer. In either case, working with an experienced condo agent is essential. The sales representatives at a new condo sales office work exclusively for the builder, so it’s important to have the proper representation while visiting any new condo sales centre. The newer a condo is, the lower the maintenance fees will be. Maintenance fees will always go up overtime. The Tarion warranty is also attractive on a newer purchase. New condo owners benefit from one year and two year warranty protection against defects in work and materials, and seven year warranty protection against major structural defects. Resale purchases also have the Tarion warranty, as long as it falls within this time frame. Closings can be as long three to five years in a pre-construction purchase, and can be postponed a few times (this can be very tricky, when you’re trying to sell your current condo). Resale closings are usually never longer than 90 days, and can be as short as a couple of weeks. There are interim occupancy fees in a pre-construction purchase. Buyers are moved in as their floor is finished, while construction continues on the above floors. All the while having to pay interim occupancy fees until the building is complete and registered. Then the buyer takes ownership and the mortgage begins. Depending on which floor the unit is on, these fees may have to be paid for several months. Resale and new condos are also taxed differently. 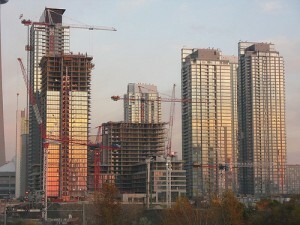 Resale condos are exempt from HST, while new condos are not. Many new condo owners sell after completion, so it might also be a good option to wait for listings of those units that have never been lived in. Either choice can be beneficial to ones particular needs. If you want to make the most educated decision on the most expensive purchase in your lifetime, having the right agent to guide you through either process is vital. If you want to be notified of VIP Broker Sales Events in advance or resale listings that haven’t reached MLS yet, contact me now.